EU-Turkey Ties on the Brink? The dream of a European Turkey is rapidly becoming an illusion. Some supported accession in the hope of improving the rights of people, others for realpolitik. Today, Europeans are deeply worried about the direction President Recep Tayyip Erdoğan is taking and a growing number of European governments have come out against Turkey's accession. Even though Turkey is polarized, support for accession among Turkish citizens is dropping in every poll. Each time we think we have reached a new low, we find our relationship deteriorating even further. Fear of what comes next may explain why the decision to completely end the accession process has not been taken on the EU level. The question is how much longer this stalemate can go on, as domestic pressures on European leaders to make a decision grow with every journalist arrested in Turkey. Hope has turned into fear over what Turkey might become. At the start of the accession process, many had hoped that with a Western-oriented population and a foundation of a secular state, Turkey could move closer to European standards step by step. Initial reforms towards meeting the Copenhagen criteria looked promising but soon went hand in hand with regression in other areas. The Ergenekon and Balyoz cases early in the accession process showed clear signals of a rule of law under political pressure, but the Gezi Park demonstrations and the police's brutal response to them brought the tensions in Turkey home for many in Europe. Additional provocations and incidents have further strained the relationship. The dream of a European Turkey is rapidly becoming an illusion. After the failed coup attempt of 2016 and the purge that followed, Europeans have come to increasingly see EU-Turkey relations through a domestic lens. While accession was always a contested topic, bilateral relations were mostly the domain of foreign policy experts. Now, the conflicts that divide Turkey are dividing communities from Berlin to Amsterdam, and have become impossible to ignore for the wider public in Europe. Supporters of Erdoğan's Justice and Development Party (AKP) are pitted against Gülenists after their alliance broke down in 2013, or against Kurdish, Alevite and secular Europeans with Turkish roots. Actions by the Turkish government have actively fueled these tensions, be it through the encouragement of reporting alleged enemies of the state, or by pushing campaign rallies in European cities ahead of the constitutional referendum. Despite painstaking efforts towards greater integration, European-Turkish flag-waving youths made clear that their loyalty remains first and foremost with Ankara. These sentiments were expressed not only by a couple of hundred demonstrators but later confirmed by the fact that 70 percent of Dutch-Turkish voters and 63 percent of German-Turkish voters who voted in the controversial referendum, supported Erdoğan's line. The fact that Turkish-Europeans are important for the Turkish government was illustrated by ministers’ eagerness to campaign in Europe. Others see the insistence to hold massive rallies as an attempt to provoke Europe. The visits by Turkish Ministers to campaign for the referendum led to diplomatic clashes with the German, Belgian, French, and especially Dutch governments. Looking at the Dutch case more closely we see a number of worrying developments. Amidst tensions, President Erdoğan has referred to the Dutch government as Nazi remnants and fascists. There is hardly an insult that unites the Dutch more strongly than that. For over a year now, there has been no Dutch ambassador in Ankara. Relations have been downgraded and it could be a while before the Netherlands will have a new Turkish ambassador. In the meantime, DENK, a pro-Erdoğan political party, caters to Dutch people with Turkish roots and has three seats in the national parliament. The party made inroads in large cities in the recent municipal elections as well. The latest confrontation came when the Turkish news website En Son Haber published the names of parliamentarians with Turkish roots voting in favor of recognizing the Armenian Genocide in the Dutch Parliament. The word “traitors” accompanied their names on the front page. The Turkish government has not actively distanced itself from this dangerous accusation. Such a label puts people at risk, and it also imports yet another conflict into the heart of Dutch society and politics. The Commission warns against a “personal regime” in Turkey in its definitive, as discussed and adopted in plenary, text of the opinion. The Commission notes that by removing necessary checks and balances, the amendments would not follow the model of a democratic presidential system based on the separation of powers, and instead would risk degeneration into an authoritarian presidential system. (v) further weakening the independence of the judiciary’. The opinion goes on raising serious procedural concerns. Turkey’s parliament approved the amendments to be put to a referendum, while several deputies from the second largest opposition party—the People’s Democratic Party (HDP) —were in jail. In addition, the vote for approving the amendments breached secret ballot rules, thereby putting the legitimacy of support for reform and personal nature of the deputies’ vote into question. Countering terrorism is increasingly abused as a pretext for repression in Turkey. Moreover, in December 2017, the Turkish parliament granted “immunity from prosecution to members of the armed forces conducting counter-terrorism operations.” On the other side of the coin, the immunity of parliamentarians has been lifted, and a number of them have even been imprisoned. While terrorist acts by the PKK are a serious threat to Turkey, these disproportionate measures go above and beyond fighting the PKK. The implementation of the constitutional amendments would make Turkey ineligible to maintain candidacy status to join the EU. Both the constitutional amendments and the purge after the failed coup attempt have severely eroded European popular support for Turkey’s EU accession. In the European Parliament, we have pointed out on several occasions, that the implementation of the constitutional amendments violates the Copenhagen criteria and would make Turkey ineligible to maintain candidacy status to join the EU. There are also people who argue we need not wait until the Constitutional amendments are implemented, and that the current, grave violations of the rule of law and human rights already constitute a de facto violation of the Copenhagen criteria. Supporters of Turkey’s EU accession have historically come from Europe's political center. This seems counterintuitive because a very conservative, large new member state joining the EU would only weaken centrists. Ironically, President Erdoğan advised German voters not to vote for any of the mainstream parties in the 2017 elections, thereby advising to weaken support for parties who have defended Turkey’s accession process. Yet progressives tended to believe that people's rights in Turkey would improve with the reforms necessary for accession. Conservatives generally wanted to keep Turkey as close as possible to the EU as a strategic necessity. Reality has caught up with both arguments. Similarly, the tensions between Turkish and American troops around Afrin in Syria have tarnished the notion that joint NATO Membership would ensure a military alliance resistant to the ebbs and flows of EU-Turkey relations. The European Parliament has always acknowledged the right of Turkish authorities to bring the perpetrators of the failed coup to justice. That does not mean every measure in name of accountability is acceptable to Europeans. In addition to highlighting the incompatibility between the Constitutional amendments and the Copenhagen criteria, we called for a freeze in the accession negotiations in light of ongoing and disproportionate human rights violations, and a full halt when the constitutional changes are actually implemented. The Commission and Council are more reluctant to speak out as clearly, but a growing number of European governments have positioned themselves against accession. One veto is enough to prevent the opening of new negotiating chapters. Yet the Council and Commission have found their hands tied by the “statement on migration,” better known as the “Turkey deal.” The deal was never public and the European Parliament never consulted. We have hardly seen a more cynical moment in Europe than when the Commission and the Council, fearing the opening of “floodgates” and streams of refugees pouring into Europe, gave Erdoğan exactly the leverage he needed. The EU is not only driven by interests but also by the rights and freedoms of people. In return for preventing refugees from coming to Europe through Turkey, the EU offered support for sheltering millions of Syrians in Turkey as well as an upgrade of the Customs Union. Much more controversial, however, is the promise of visa liberalization made conditional to Turkey fulfilling the criteria agreed to in a 2013 roadmap. Additionally, accession would be “re-energized.” The sheltering of refugees is a shared responsibility of the international community, and Turkey should be praised for its role in admitting millions. But the trade-off between ending refugee flows into Europe on the one hand, and visa liberalization and accession on the other, has undermined Europe’s credibility when it comes to its own values and principles. In the back of their minds, both Turkish and the European leaders know that accession is going nowhere. Nevertheless, many perversely see the frozen accession process as the optimal solution. Despite numerous provocations, arrests of dual citizens, the diplomatic fallout, and tensions between NATO allies, a formal end to the accession process has not been declared. This situation is, in fact, anything but optimal. Pro-European Turks are frustrated about the lack of progress, and equally so, progressive Europeans worry about both authoritarianism under President Erdoğan as well as the lack of condemnations from European leaders. Creating an alternative to accession necessitates a push for various EU-Turkey initiatives relating to trade, foreign policy, and migration. An upgrade of the Customs Union has been anticipated for a while and makes economic sense for both the EU and Turkey. Yet a reluctance to “give” anything to Erdoğan from the European side has prevented the Council and European Parliament from drafting a mandate to the European Commission to negotiate such an upgrade. The European Parliament’s hesitation also stems from our intention to seek levers to be able to demand meaningful improvements to the rule of law and human rights in Turkey. If Turkey is interested in an upgraded Customs Union, it should expect negotiations to be laced with strong conditionality on human rights and the rule of law. Such conditionality principles should also underline for the population in Turkey that the EU is not only driven by interests but also remains committed to the rights and freedoms of people. In addition to concerns about human rights and the rule of law, the abuse of emergency measures and granting immunity to those fighting terrorism further complicates cooperation. In this domain too, Europeans should make it crystal clear that whatever shape foreign affairs and strategic cooperation take, the rule of law and human rights cannot be swept under the rug. Conditionality on paper is not enough; to keep human rights and the rule of law a priority, both an upgrade of the Customs Union as well as any new form of cooperation on security or migration must be grounded on conditionality principles. Some have suggested inviting President Erdoğan to summits with government leaders in order to get things moving in the field of foreign affairs cooperation. That would not only be an unprecedented step but would be the wrong signal at the wrong moment. A structured dialogue on strategic and foreign affairs issues makes more sense. EU engagement with Turkey on foreign affairs and defense matters should also aim to anchor Turkey more firmly within NATO. The failed coup and the arrest of numerous people from the top tiers of the military should concern NATO partners. They, along with the EU, should take a clear interest in due process and fair trials for suspects. Having high-level members of the military of an ally accused of terrorist and treasonous acts is at least as troubling as having these same individuals falsely convicted of such grave crimes. What is essential for Europe is to signal to the population of Turkey that complicated relations with the government do not come at the expense of the population. Instead, ensuring Erasmus+ participation and other people-to-people contacts and exchanges should be a European priority. Access to such opportunities should be inclusive and not politicized. Ensuring Erasmus+ participation and other people-to-people contacts and exchanges should be a European priority. Debates on the future of the relations will most likely not take place in isolation. The times when the discussion about Turkey was the domain of foreign policy experts is over. The above has illustrated how, with ongoing provocations from Ankara and diverging signals from Europe, a future relationship will be difficult to shape. Still, the strategic significance of keeping Turkey as closely as possible to democratic and Western standards cannot be underestimated. Things can get worse still, and all must be done to avoid that. The current situation illustrates that the previous overwhelming support for Turkey's accession process to the EU is not a guarantee for success. Yet the core of the political spectrum in various European countries defended what increasingly became an uphill process. That changed, however, when increased repression and polarization were cast in the heart of European policy debates. Every journalist arrested or sentenced contributes to a conviction within European public opinion that Turkey is drifting further away from Europe, and from the promise of democratization. This slow motion divorce ends the dream of a European Turkey, or a Turkey in the European Union. There are no easy roads to take and an alternative future relationship requires compromise from both sides. First and foremost, Europeans need to understand how important Turkey is, and not lose sight of the significance of solid cooperation between the two. Similarly, Turks will have to accept that discussing trade or foreign policy cooperation with the EU comes with clear conditionality on human rights and the rule of law. “The court case that changed Turkey,” BBC News, 5 August 2013; “Turkey protests spread after violence in Istanbul over park demolition,” The Guardian, 1 June 2013. “Turkish diaspora in EU divided over Erdoğan following failed coup,” The Guardian, 18 July 2016. “Why German Turks Voted for the Autocrat Far Away,” The New York Times, 21 April 2017; “Turkey referendum: The numbers that tell the story,” BBC News, 17 April 2017. Esther King, “Turks abroad play pivotal referendum role,” POLITICO, 17 April 2017. “Turkey referendum: More rallies banned in Europe,” BBC News 10 March 2017. “Turkish President Erdoğan Calls Dutch ‘Nazi Remnants,’” Foreign Policy, 13 March 2017. “Ermeni Soykırımı var diyen 5 Türk vekil,” [5 Turkish MPs who approved Armenian Genocide] En Son Haber, 24 February 2018. Press statement 110th Plenary - Turkey – “Proposed constitutional amendments ‘dangerous step backwards’ for democracy,” The Venice Commission, 10 March 2017. “Turkey - Opinion on the amendments to the constitution adopted by the grand national assembly on 21 January 2017 and to be submitted to a national referendum on 16 April 2017,” The Venice Commission, 10 March 2017. “Turkey grants immunity to security forces fighting militants,” Reuters, 24 June 2016. “Turkish parliament votes to lift MPs' immunity from prosecution,” The Guardian 20 May 2016. See e.g. European Parliament Committee on Foreign Affairs, Draft Report on the 2016 Commission Report on Turkey (2016/2308(INI)), 18 April 2017. “Erdoğan: Don’t vote for Merkel or Schulz,” Politico, 18 August 2017. “Why Turkey’s troops are in Syria again,” The Economist, 29 January 2018. See e.g. European Parliament, “Resolution on the current human rights situation in Turkey” (2018/2527(RSP)), 8 February 2018. “Draft Report on the 2016 Commission Report on Turkey,” European Parliament Committee on Foreign Affairs, (2016/2308(INI)), 18 April 2017. “Austria election victor calls for end to Turkey's EU entry talks,” Reuters, 19 October 2017; “Belgian PM Michel calls to end Turkey’s accession negotiations with the EU,” Stockholm Center for Freedom, 22 March 2017. 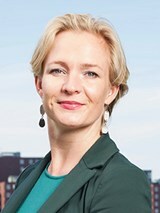 Marietje Schaake is a Dutch politician and Member of the European Parliament from the Netherlands.